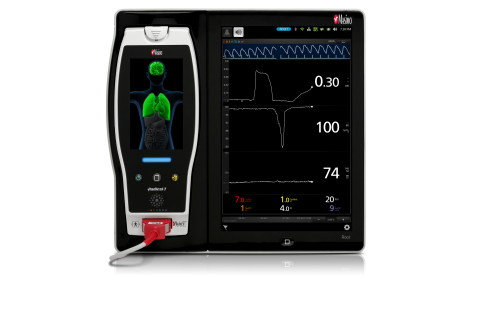 ORi is a noninvasive, relative indicator of a patient’s oxygen reserve in the moderate hyperoxic region (partial pressure of oxygen in arterial blood [PaO2] in the range of 100 to 200 mmHg). As an “index” parameter with a unit-less scale between 0 and 1, ORi can be trended and has optional alarms to notify clinicians of changes in a patient’s oxygen reserve. In the study, Dr. Koishi and colleagues at Iwate Medical University in Morioka, Japan sought to evaluate whether ORi could serve as an early warning of desaturation in patients undergoing OLV, as such patients are often prone to hypoxemia. To this end, they assessed whether ORi decreased earlier than SpO2 during OLV, and evaluated how well ORi correlated with an invasive PaO2 measurement. ORi and SpO2 were measured every 2 seconds using a Masimo Root® with Radical-7® Pulse CO-Oximeter® and rainbow® sensors (revision L). The anesthesiologist was blinded to the ORi values. For data analysis, the researchers defined the start of the decrease in ORi as when its value fell below 0.05 less than its highest value after OLV began, and the start of the decrease in SpO2 as when it was 1% less than the maximum SpO2 value. PaO2 was calculated as part of blood gas analysis and performed every 3 minutes during OLV, resulting in 101 pairs of measurements. The researchers found that from the start of OLV, ORi started decreasing significantly sooner than SpO2, a mean of 171 seconds vs. a mean of 372 seconds, p<0.01 (standard deviation of 102 and 231 seconds, respectively). They also found “a significant, strong correlation” between ORi and PaO2: r2=0.671, p<0.01. ORi has not received FDA 510(k) clearance and is not yet available for sale in the United States. Koishi W, Kumagai M, Ogawa S, Hongo S, and Suzuki K. Monitoring the Oxygen Reserve Index can contribute to the early detection of deterioration in blood oxygenation during one-lung ventilation. Minerva Anestesiologica. 14 May 2018. DOI: 10.23736/S0375-9393.18.12622-8. This press release includes forward-looking statements as defined in Section 27A of the Securities Act of 1933 and Section 21E of the Securities Exchange Act of 1934, in connection with the Private Securities Litigation Reform Act of 1995. These forward-looking statements include, among others, statements regarding the potential effectiveness of Masimo ORi™. These forward-looking statements are based on current expectations about future events affecting us and are subject to risks and uncertainties, all of which are difficult to predict and many of which are beyond our control and could cause our actual results to differ materially and adversely from those expressed in our forward-looking statements as a result of various risk factors, including, but not limited to: risks related to our assumptions regarding the repeatability of clinical results; risks related to our belief that Masimo's unique noninvasive measurement technologies, including Masimo ORi, contribute to positive clinical outcomes and patient safety; risks related to our belief that Masimo noninvasive medical breakthroughs provide cost-effective solutions and unique advantages; as well as other factors discussed in the "Risk Factors" section of our most recent reports filed with the Securities and Exchange Commission ("SEC"), which may be obtained for free at the SEC's website at www.sec.gov. Although we believe that the expectations reflected in our forward-looking statements are reasonable, we do not know whether our expectations will prove correct. All forward-looking statements included in this press release are expressly qualified in their entirety by the foregoing cautionary statements. You are cautioned not to place undue reliance on these forward-looking statements, which speak only as of today's date. We do not undertake any obligation to update, amend or clarify these statements or the "Risk Factors" contained in our most recent reports filed with the SEC, whether as a result of new information, future events or otherwise, except as may be required under the applicable securities laws.